Hi everybody! I hope you are doing well. Things have been a little crazy around here. Maybe you can relate? LOL I sure hope you will forgive me for my oh so sporadic blog posts lately. Not only have I been super busy preparing for the launch of my shoppe, but also my littlest furbaby Pumpkin (who is a Yorkie just shy of 4 lbs.) had fourteen teeth removed last week. OUCH!!! She has needed extra attention ever since...making sure she was getting enough water, softening her dog food, and just all around TLC. She is on the mend though, and steadily working her way back to normal. Thanks for stopping by my little neck of the galaxy today! Gorgeous card Anita, you really have done a fantastic job of making a great boy card we all seem to struggle with. Thanks for taking part in our challenge, good luck. Love your card Anita!! I sure hope your little yorkie is doing better!! That hurt just thinking about it!! I'm so excited for your store opening -- be sure to shoot me a note when you go live!! Blessings and Hugs! Your poor little poopsie! I sure hope Pumpkin feels all better soon! This card is absolutely adorable and the coloring is great! You go girly!!! I'm so excited to see what's in store for us at your new shoppe! When are you expecting to launch? 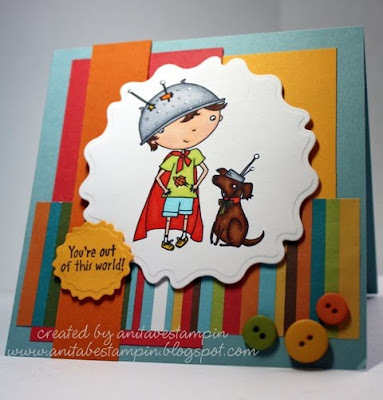 Love the stand out colors on this card Anita and your coloring is awesome! Hope you little dog is doing better!